Arondil is an Altmer conjurer, necromancer, and necrophile. He originally lived in Dawnstar, where he was studying techniques for reanimating the dead, and often spent time imagining secret encounters between himself and some of the local girls. A buyer is interested in Arondil's four part journal. However, when the local citizens found out he was performing experiments on the dead, he was exiled from Dawnstar and moved to Yngvild, an ancient Nord burial ground filled entirely with dead female draugr, which he used as subjects for his experiments. In his time spent alone, his thoughts changed from the women in Dawnstar to his new dead women in Yngvild. He reanimated each subject into a state of total complacency, bending to his every whim. He ordered some to guard the island, while the rest acted as his personal entourage, never leaving his side. When his guards caught and brought him a young milk maid from Dawnstar during one of his few moments alone with his favorite servant, she accused him of stalking her, although he claims that she was "nowhere near the most noticeable of maidens in town." Arondil, fearful of discovery and more unwanted guests, had her killed and began new experiments on her, excited by the chance to use fresh materials. The experiments were a complete success and she appeared more phantasm than reanimated dead. He ordered his servants to go and find any more subjects that may have become lost while wandering around Yngvild, continually improving and expanding his collection of undead slaves. 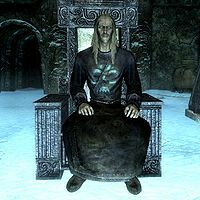 Sneaking into the final chamber of Yngvild unnoticed and removing the soul gem from the pedestal next to Arondil causes the ghosts near him to attack and kill him. This issue has been addressed by version 2.0.4 of the Unofficial Skyrim Patch; his corpse will now clean up properly.